As you may know, for the past two years, the Franciscans of Sacred Heart Province have been raising money to dig wells in the Democratic Republic of Congo. This is an update on that project. 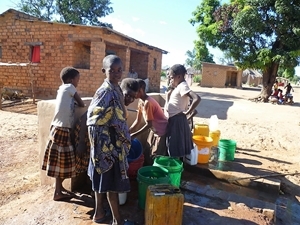 The first two wells were completed in the villages of Mulenga and Kienge. Each well uses a solar-powered controller and consists of four large reservoir tanks. Pipes run from the well to a 4-spigot watering station. The excitement of the children when they saw running water in their village for the first time is truly heart-warming. The friars of the DRC recently asked us to help with two new projects. In the village of Kibwe, the outdated well is run by a generator—much less reliable and much more expensive than a solar controller. Also, there is virtually no storage capacity, so water is not readily available throughout the day. We have sent funds to upgrade this well. The village of Lukonzolwa is in an area where the ground is too rocky to drill for a well. In the past, water was delivered by a series of pipes running from the mountains. When armed conflict broke out in the region several years ago, the pipes were either stolen or destroyed. We have sent funds to restore the water delivery system. This month, the friars in the DRC have asked for assistance in digging wells in two more villages, Kilumba and Mwemena—though work on those projects can’t begin until the rainy season is over. By the time those two wells are completed, we will have exhausted our resources and the project will come to an end. On behalf of the friars and the people of the DRC, I extend thanks to all our many donors and supporters. The friars of the Sacred Heart Province, through the generosity of over 900 donors, have now been able to finance the digging of a 4th well in the Democratic Republic of Congo. 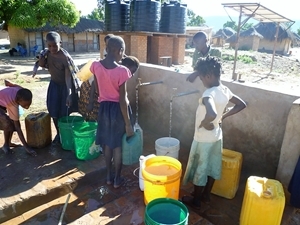 Use this link to see a video of the village children's reaction to having running water in the village for the first time. Earlier this year, the seven provincial ministers of the United States announced the creation of an interprovincial postulancy program. The new program, which began last month, is located at Holy Name College in Silver Spring, Md. Below, two postulants share an update on the first few weeks in the program. As you can see, we have men from a diverse group of of ages, heritages, and provinces. God is good! After orientation, we took part in an in-house compass retreat, where we opened up to each other and reflected on the directions our lives are taking. That weekend, with openness, we joined the friars at the Church of St. Francis of Assisi in New York City to witness the Aug. 26 solemn vows of Brothers Casey Cole, OFM, and Ramoncito Razon, OFM, of Holy Name Province. The solemn profession of our brothers before the Franciscan community, including our General Minister, was a poignant way to mark so many fresh beginnings. On Aug. 31, Fr. Mark Schoener, OFM, the provincial minister of St. John the Baptist Province, was the celebrant for a welcome Mass at Holy Name College, officially marking the beginning of the United States’s first interprovincial OFM postulancy program. Members of the formation team presented each postulant with a Tau cross that was handmade by novice Luis Rosado of Holy Name Province. The Secretaries of Formation – Martin Ibarra, OFM, (of St. Barbara Province), Carl Langenderfer, OFM, (of St. John the Baptist), Ralph Parthie, OFM, (Sacred Heart), and Kim Studwell, OFM, (Assumption BVM) – as well as friars from Holy Name Province – including members of the Holy Name College and St. Camillus Parish friar communities – all joined in the Eucharist and ceremony. They were followed by a festive social and dinner. When the electricity and the internet are working at the same time in the Democratic Republic of Congo, the friars are able to send us emails about our projects. Friar Jean-Marie Mufeji managed to send a couple of pictures of people using the new well in the village of Kienge. I understand that Fr. Damien Isabel was able to arrange a visit to both Mulenga and Kienge to ask villagers how the wells will affect their lives. I'm waiting to hear.